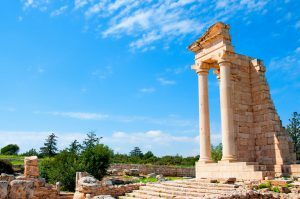 Apollos is somewhat prominent in the New Testament, so who exactly is Apollos and why is it important that we know? Apollo is a Greek name and in Greek mythology, he was the son of Zeus and Leto, the twin brother of Artemis. Apollo is often depicted as playing a golden lyre, but he was also known as the Archer, shooting with a silver bow, and also the god of healing. Apollo was thought to have given the science of medicine to mankind, but Apollo was also the god of light and the god of truth. This is one busy god if you ask me because Apollo also had to harness his four-horse chariot in order to move the Sun across the sky, so Apollo is a very important to the Greek culture, even into the first century, so Apollos mentioned in the New Testament must have gotten his name from the Greek god, Apollo, so Apollos is a Greek, and all Greeks at the time were considered Gentiles to the Jews, but so were all others who were not Jewish. We first read about Apollos as he is introduced in the Book of Acts during the first century church, and the first mention of Apollos is in Acts 18:24 where it says, “Now a Jew named Apollos, a native of Alexandria, came to Ephesus. He was an eloquent man, competent in the Scriptures.” Apparently, Apollos may have been a Hellenized Jew but his name indicates he was born a gentile or a Greek, and in the early church there were exceedingly few Gentiles in the church, but Apollos is an exception, perhaps because he was “an eloquent man” who was “competent in the Scriptures,” so Apollos knew the Old Testament and was well studied in them. His knowledge of the Old Testament may have helped him to see that Jesus was clearly the Messiah, the Son of God, and that’s why he put his trust in Christ as the anointed or “Christos” of God. Apollos is first mentioned as a Christian preacher who had come to Ephesus (probably in the year 52 or 53), and is first described as “being fervent in spirit: he spoke and taught accurately the things concerning Jesus, though he knew only the baptism of John” (Acts 18:25). When Apollos first enters the picture in the Book of Acts, he was a strong disciple of John the Baptist and recognized that humanity had a sin nature that required repentance, and so Apollos would “speak boldly in the synagogue, but when Priscilla and Aquila heard him, they took him aside and explained to him the way of God more accurately. And when he wished to cross to Achaia, the brothers encouraged him and wrote to the disciples to welcome him. When he arrived, he greatly helped those who through grace had believed, for he powerfully refuted the Jews in public, showing by the Scriptures that the Christ was Jesus” (Acts 18:26-28). Apollos was unafraid to confront the Jews with the truth about Christ, and since he was “competent in Scriptures,” he likely had little trouble proving that Jesus Christ was the long-awaited Messiah, and showed this “by the Scriptures that Christ was Jesus,” so Apollos was a powerful preacher of the Word, proving that Jesus was the Christ from Scripture. He spoke and taught accurately the things concerning Jesus. The Apostle Paul was apparently well acquainted with Apollos because it says that “it happened that while Apollos was at Corinth, Paul passed through the inland country and came to Ephesus. There he found some disciples” (Acts 19:1). We know that Apollos had a huge following because in the Book of 1 Corinthians, Paul rebukes the church at Corinth about following men and not following Christ. Paul told the church, in rather stern fashion, “What I mean is that each one of you says, “I follow Paul,” or “I follow Apollos,” or “I follow Cephas,” or “I follow Christ” (1 Cor 1:12). The last thing Paul or Apollos would have wanted was for the church to be following them instead of Christ, or to have the church at Corinth debate over who is the best teacher. They were divided over who to follow; Paul, Apollos or Cephas (the Apostle Peter), so again Paul asks, “For when one says, “I follow Paul,” and another, “I follow Apollos,” are you not being merely human” (1 Cor 3:5), because “What then is Apollos? What is Paul? Servants through whom you believed, as the Lord assigned to each” (1 Cor 3:6)? Paul’s conclusion is that we are nothing but vessels that God uses to bring people to Christ, or as Paul said, “I planted, Apollos watered, but God gave the growth” (1 Cor 3:6). When the Apostle Paul wrote to Titus, he made sure to tell him to “Do your best to speed Zenas the lawyer and Apollos on their way; see that they lack nothing” (Titus 3:13), so Paul wanted to make sure that Apollos was well taken care of, but also to have them send Apollos and Zenas to him as quickly as possible because he was preaching the gospel along with Paul and Zenas the lawyer. There is some speculation that the Apostle Paul, along with Apollos, wrote the Book of Hebrews, although we can’t say with100% certainty, as many scholars believe it was Paul, but Apollos may have had some input in this book, but we do know for certain that Apollos was a preacher of the word, and was “competent in Scriptures,” so he knew the Scriptures well enough to prove that “the Christ was Jesus,” and “he greatly helped those who through grace had believed, for he powerfully refuted the Jews in public, showing by the Scriptures that the Christ was Jesus” (Acts 18:27-28). Who was Apollos? A powerful preacher of the Word, preaching that Jesus was the Christ to the Jews, and had many followers, although Paul makes it clear that Apollos and the others are only “Servants through whom you believed,” and were “assigned to each” of them in the church, but Apollos played a crucial role in the first century church, and although we don’t hear much about him today in preaching or teaching, this eloquent man knew the Scriptures well enough to establish that Jesus was the Son of God, and that they must repent and put their trust in Him in order to be saved, so it was by divine providence that “Apollos, a native of Alexandria, came to Ephesus,” and helped Paul and the church, and as a result, God added to their numbers and the church grew. Previous post: Could Jesus Have Sinned? Next post: What Does the Bible Say About Keeping Vows?